A year after its successful “Pointe/Counterpointe,” the Harvard Ballet Company (HBC) is a completely different organization—but it has maintained a high quality of performance in its spring show, “Bravura and Blues.” With a throng of new, talented freshmen, the greatest triumph of the HBC’s latest recital is its demonstration of impressive technical skill on pointe. Produced by Valentine N. Quadrat ’09 and co-directed by Caitlin L. M. Kakigi ’09 and Kevin Shee ’10, the HBC performance—the group’s first major recital since its Loeb Mainstage hit, “American Grace”—was produced Saturday at the Harvard Dance Center. “Bravura and Blues,” featuring five short numbers and variations from the famous piece “Paquita,” provided an evening of elegant entertainment. Excerpts from “Blue Until June” first took the stage, featuring six talented dancers in a stylistic mixture of classical ballet and blues. The dancers embraced the music, capturing jazz-like riffs in the movement of their body. There were three sections to the piece, which was staged by Jason Hartley, and each was uniquely striking: an impressive opening group number, a captivating pas de deux, and a strange—but nevertheless entertaining—final ensemble. The second piece, “Untitled (Baroque in Black Dresses),” was the greatest disappointment of the night. 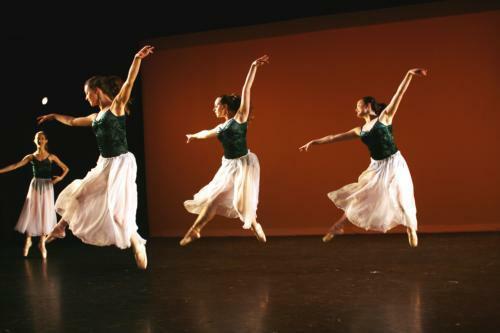 With thoughtful choreography by Diana L. Limbach ’05, many of the simple movements originated from minuet dancing, perhaps commenting on old-fashioned dance forms. However, this choice limited the complexity of the performance, and the dancers’ long, obtrusive skirts covered the few challenging steps they executed. Moreover, the sporadic use of a plastic folding chair as a prop looked awkward and arbitrary. Despite the beautifully illuminated, single-file exit of “Untitled,” this piece was on the whole dissatisfying and unexciting. “Portador del Corazón,” choreographed by Joshua Legg, did not prove much better than “Untitled.” The costumes were unpleasant, unflattering, and distracting—clashing bright green and blue velour leotards matched with too-long white tulle skirts. A trio unfortunately dressed in bright blue gave a particularly sloppy performance, one of which opened with an extremely messy pirouette turn. A pair in green entered with leaps that, because of their bent front legs and little altitude, were disappointing to watch. Nonetheless, Sarah C. Kenney ’08 (also clad in green) was the one redeeming factor of the piece, giving a generally clean performance. Thankfully, “Bravura and Blues” soon took a turn for the better. “A Little Happy, A Little Sad,” choreographed by Kenney, began and ended with visually gorgeous poses—black silhouettes against a bright blue background. The costuming choice was simple: elegant leotards that allowed the audience to see the dancers’ successes and mistakes alike, with no distraction from the outfits. Coral R. Martin ’10 gave a particularly lovely performance as the highlight of a complex group choreography that felt beautifully nostalgic. “Bach Suite” also provided one of the most spectacular performances of the night. Not only did Larissa D. Koch ’08 contribute an absolutely exquisite choreography, but the dancers also delivered an equally enchanting performance. There is nothing more interesting than to see the phenomenal juxtaposition of modern ballet set to old-fashioned music—and to see dancers finding the modern rhythms in that music as successfully as they did in “Bach Suite.” The pairing of Lauren E. Chin ’08 and Joanna R. Binney ’08 was visually stunning, with stellar turns, impressive footwork, and great unison. With this perfect choreography, excellent execution, and beautiful costumes, “Bach Suite” was the most spectacular performance of the night. The second half of “Bravura and Blues” was a series of excerpts from “Paquita.” Made up of two group numbers, nine solo variations, and three pas de trios, “Paquita” was a challenging choice—both for its technical difficulty and requisite Spanish flair. Arguably the most difficult part of “Paquita” (and also my personal favorite), the “Esmeralda” variation, was performed by Merritt A. Moore ’10. Although her turns were often a bit sloppy, Moore’s natural ballerina extension was beautifully displayed with her gorgeous grands jetés and footwork. Evoking a Spanish gypsy is no easy task, and Moore did a generally lovely job. But one question must be asked: Where was the tambourine? Many of the most impressive parts of this variation typically come when the dancer alternates playing a tambourine with her hand, elbow, and pointe shoe, rapidly. Moore’s dancing, though technically impressive, seemed incomplete without this key prop. The other impressive moment in the HBC “Paquita” performance was the stellar fuete turn sequence during the finale—which was otherwise a bit lackluster, most likely due to a tired cast. At this point in the night, the dancers in the finale did not fully finish their steps and their lines became a bit uneven. Like the ending of “Paquita,” “Bravura and Blues” provided an evening of highs and lows. Despite the mediocre “Untitled” and “Portador,” HBC was hugely successful with the rest of the show. Considering the presence of so many new talented freshmen with technically stunning pointe skills, HBC can only expect improvement from an already admirable quality of performance. —Reviewer Giselle Barcia can be reached at gbarcia@fas.harvard.edu.